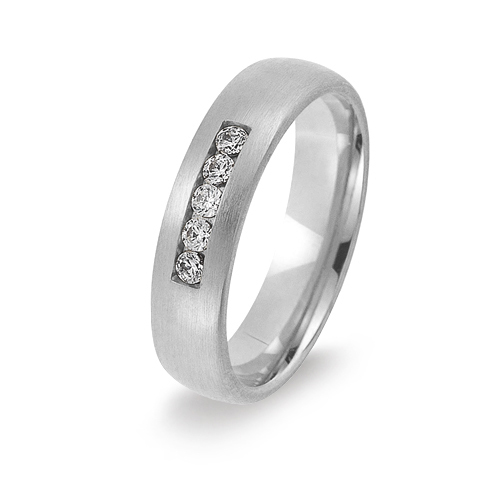 This sophisticated design has a luxurious brushed satin finish and is channel set with 5 beautiful brilliant cut diamonds. The total diamond weight is 0.15ct. Diamond clarity is VS and colour is F-G (Rare White). The upper surface of the ring is slightly curved and the inside is gently rounded for a comfortable fit. Depth is 2mm and width is 5mm. Available in 9ct and 18ct white gold, palladium 950 and platinum 950. Sample service available.Also available in rose or yellow gold - please contact us. Although our rainbow rings are not available as replicas, we can post you a single colour sample of this ring* in a standard size to try on at home. It exactly reproduces the shape of the design and the brushed finish but not the rainbow colours. It's a free service, we just ask for a deposit which will be refunded in full once the ring is returned. We will also loan you ring sizers so you can be sure of your sizes. Please select your approximate ring sizes below and click add to bag. Further rings or samples may be added before you check out. See our Terms and Conditions. * Our sample is yellow in colour.